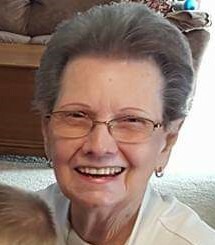 Shirley Marilyn Rogers, 82, of Ewing, passed away Friday, March 22, 2019, at her residence. She was the widow of Carl Edwin “PeeWee” Rogers. She was born in Palacios, TX, on October 1, 1936, to the late George Dewey and Ima Ivy Cooper. Shirley is survived by her children, Sharon (Dan) Hicks of Ewing, Patrick “Pat” (Kay) Rogers of Lake Charles, LA, and Michael “Mike” Rogers of Richmond, TX; her grandchildren, Joshua D. (Bethany) Hicks, Christopher C. Rogers, Bonnie Hicks (Nicholas) Brewer, and Stacy Rogers. She is also survived by her great grandchildren, Kaitlin Shaye Hicks, Roland Graham, Daniel Carl Hicks, Jordyn Rogers, Makenzie Rogers, Carter Edwin Brewer, Deacon Frank Brewer and Londyn Lee Pollitt; and her sisters, Dorothy Collins and Frankie Faye Cooper, both of Palacios, TX. In addition to her husband and her parents, she was also preceded in death by her two brothers, Felton and Paul Cooper; her sisters, Margie Johs and Kathleen Peerbolte; and her beloved daughter-in-law, Denise Lynn Rogers. Service will be 1 p.m., Wednesday, March 27, at Boone-Nickell Funeral Home with Bro. Chris Hamm officiating. Shirley will be laid to rest in Elizaville Cemetery beside her husband. Pallbearers include Josh Hicks, Nicholas Brewer, Christopher Rogers, Cliff Pollitt, David McGlone, Jerry Kissick, Billy Sapp, and Johnny Ruark. Honorary pallbearers include Leo Foisner, Donnie Brewer, Roland Graham, Daniel Hicks, Carter Brewer, Deacon Brewer, Timmy Ramey, Mark Fryman, Dickie Flora, Jerel Purcell, and Mike High. In lieu of flowers memorials are suggested to Sugar Loaf Christian Camp (637 Prater Road, Wallingford, KY 41093) and/or Battle Run Christian Church (C/O Mike High, 3480 Mt. Carmel Road, Flemingsburg, KY 41041).